This complete 6 piece grey sectional patio sofa set will create an intimate backyard space that you and your friends will love. Meticulously constructed with an aluminum frame, a variegated grey woven base, UV weather resistant fabric and materials makes it easy to care for and a joy to own. Add relaxing in the cozy CorLiving Oakland Collection to your exciting summer plans. The PPO-851-M middle seat with deep back matches the design of the rest of the PPO-851 set so you can make the configuration you need. The textured black resin rattan weave is complimented by high quality, weather resistant foam seat cushions wrapped in washable red woven seat covers. Just add the legs, and it's ready to use upon delivery! Add relaxing in the cozy Sonax Park Terrace collection to your exciting summer plans. Our Saddle Strap Resin Rattan Weave is complimented by high quality, weather resistant foam seat cushions wrapped in zippered and washable Coral Sand covers. Stretch out on the easy to arrange sectional or put your feet up on the ottoman while sitting in the deep backed chair, the options are infinite. With our clever design, the ottoman can easily be converted into a stout coffee table by removing the cushion. Complete your set with toss pillows are in five different colours, sold separately as a set of four. Ready to use upon delivery, you can complete your summer with this comfortable patio set from Sonax. Relax in the cozy Sonax Park Terrace collection this summer. Our Saddle Strap Resin Rattan Weave is complimented by high quality, weather resistant foam seat cushions wrapped in zippered and washable Coral Sand covers. Stretch out on the easy to arrange sectional or put your feet up on the Ottoman while sitting in the deep backed chair, the options are countless. With our clever design, the Ottoman can easily be converted into a stout coffee table by removing the cushion. Complete your set with toss pillows are in five different colours, sold separately. Ready to use upon delivery, you can complete your summer with this comfortable patio set from Sonax. Park Terrace 5-Piece Patio Sectional Set in Textured Black Make your patio the highlight of everyone's summer with the Park Terrace collection. Featured in our Textured Black Weave and accented with Salt and Pepper Seat Covers this versatile set is perfect for all of your summer entertaining. 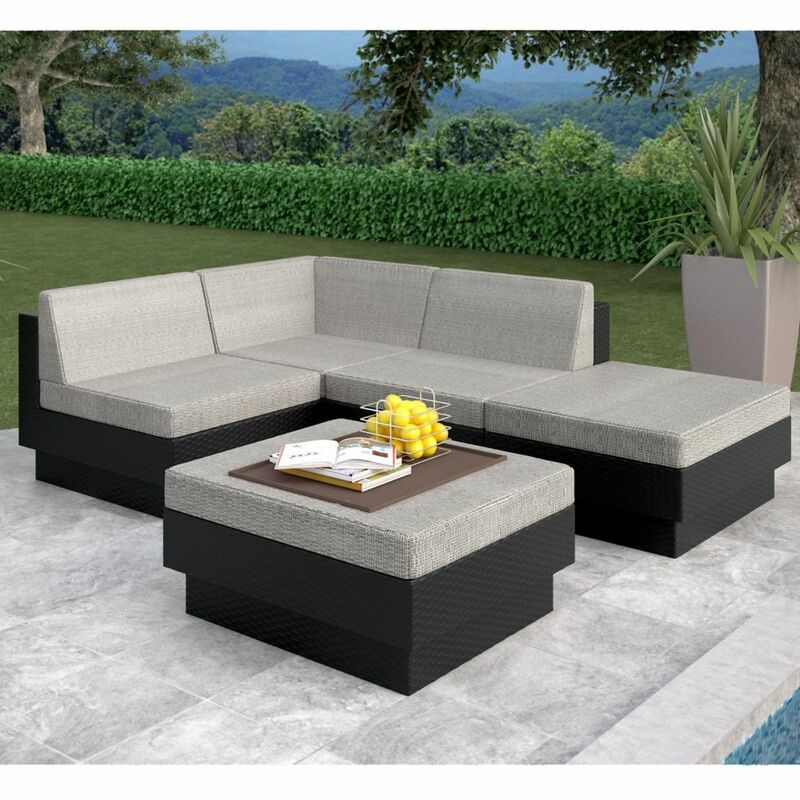 Made with UV resistant Textured Black Resin Rattan Wicker, water repellent cushions and a durable aluminum alloy frame each part of this set is as stylish as it is durable. Arrange this easy to move set to suit your needs on a whim, you can even transform the cozy ottoman into a modern coffee table instantly. Ready to use upon delivery, you can complete your summer with this comfortable patio set from Sonax.